The Merry Librarian: True Stories from a Library Near You…No "Shh"! Here's a new website for librarians to check out, The Merry Librarian(www.merrylibrarian.com), and features true stories submitted by librarians from around the world. The stories range from hilarious to heartbreaking; and anyone who has ever worked in a library will both enjoy the stories and relate to the outrageous situations librarians find themselves in. Read more about The Merry Librarian: True Stories from a Library Near You…No "Shh"! Cool website: Ask for It By Name, explaining the origins of popular product names. On the home page today is the origin of the domain name 'eBay'. Code for America is a new idea that’s in the process of becoming a program and a non-profit organization. Cities are under greater pressure than ever, struggling with budget cuts and outdated technology. What if, instead of cutting services or raising taxes, cities could leverage the power of the web to become more efficient and effective? What if interacting with your local government was more like using Facebook or Yelp? What if, instead of reinventing the wheel every time, cities shared technology resources? We believe there is a wealth of talent in the web industry eager to contribute to the rebuilding of America. Learn more by subscribing at this link and identifying yourself as either a ~geek~ or a ~wonk~. Washington State Library releases new "Hard Times Resource Guide"
For the past few months, staff at the Washington State Library have been working hard, exhaustively scouring the web and compiling quality resources to help library users across Washington State. The result? A thorough guide detailing resources and techniques to help you and your users navigate this tough economy. Read more about Washington State Library releases new "Hard Times Resource Guide"
Have a question? Try Ask-WA! Ask-WA is pleased to announce the launch of Washington State's first online virtual reference portal. Connecting more than 60 libraries across the state, and backed by a worldwide cooperative, Ask-WA provides 24/7 reference service to the library users of Washington State. Ask-WA is an essential resource for students looking for citations at three in the morning, for Washington residents doing personal research, for genealogists. Read more about Have a question? Try Ask-WA! It's that time again! "I love thee to the depth and breadth and height my soul can reach..."
Nominate your librarian at I Love My Librarian 2009 Award. 6. LEARN A NEW FACT EVERY DAY. 7. ASK AND ENCOURAGE QUESTIONS. 8. GET OUT OF THE HOUSE. 9. LOVE YOUR BOOKS AND YOUR LIBRARY. 10. LOOK FOR OLDIES BUT GOODIES. Courtesy of James Patterson's Read Kiddo Read, twelve ways to get kids reading...and they don't all involve sitting down with a book. Each link is clickable on the site. Read more about Get Those Kids Reading!! I don't know about the rest of you, but I wonder about what a given writer's studio looks like. Do they have a studio? An office? Do they just bang away at a laptop sitting on the dining room table? The way an author lays out their workspace is really intriguing to me. Where I Write is a project by Kyle Cassidy. It's a collection of photographs and interviews with authors about where they do their job. It's a fantastic and intimate look into the places that our favourite books first happen. 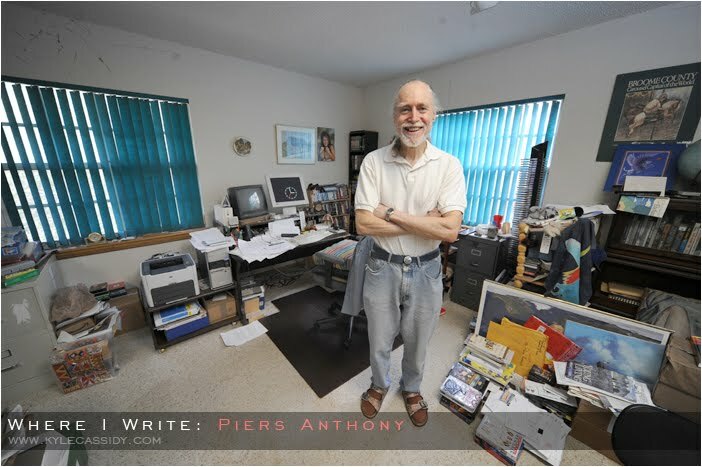 He's planning a compilation book of his own, including the workspaces of Neil Gaiman and Lois McMaster Bujold. Launched in March 2002, COUNTER (Counting Online Usage of Networked Electronic Resources) is an international initiative serving librarians, publishers and intermediaries by setting standards that facilitate the recording and reporting of online usage statistics in a consistent, credible and compatible way. The first COUNTER Code of Practice, covering online journals and databases, was published in 2003. COUNTER.s coverage was extended further with the launch of the Code of Practice for online books and reference works in 2006. The body of COUNTER compliant usage statistics has steadily grown as more and more vendors have adopted the COUNTER Codes of Practice. This has contributed to the new discipline of usage bibliometrics and a great deal of work is underway to try to establish .value metrics. associated with usage, in which the COUNTER compliant statistics play an increasingly important role.. In case you've been in Casablanca or otherwise out of the librarian loop this summer (or not on facebook), you might not know about the Facebook Group People for a library-themed Ben & Jerry's flavor! But now you do know about it and there's been a 'call to action'! So, here's the deal now. Time to step it up and take some action in a couple easy steps. (1) Submit a flavor to Ben & Jerry's directly. Appeal to the 5 Flavor Gurus directly! (Arnold, John, Eric, Peter, & Nettie) Here is the link for their Suggest a Flavor form. And here are a couple of the flavors, easy to cut & paste into the form. Pick one and submit (or submit one of your own).